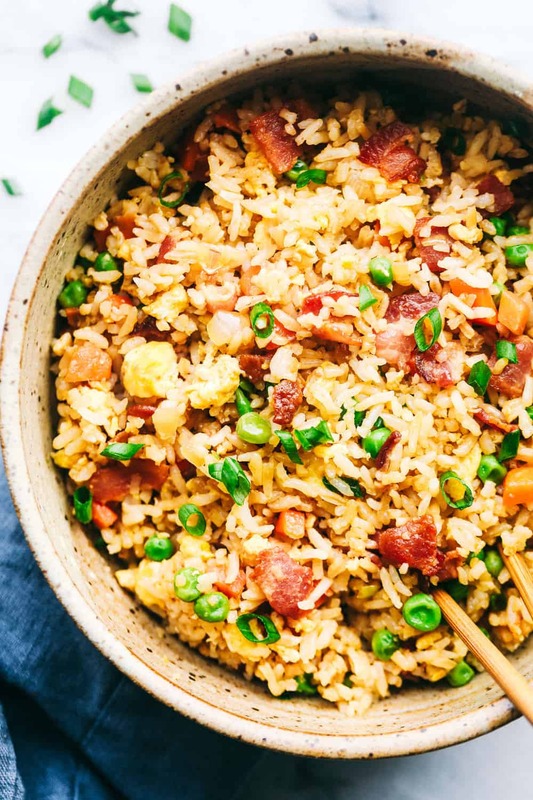 Bacon Fried Rice is 1000x better than takeout and has crispy bacon, eggs, peas, carrots and rice that combine to make the best fried rice ever! 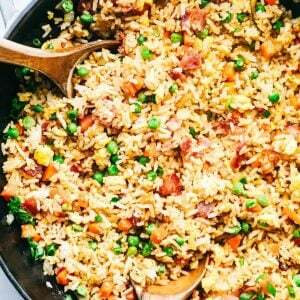 We are obsessed with fried rice at our house and love these other recipes as well! Easy Fried Rice, Shrimp Fried Rice, Hawaiian Fried Rice, and Cauliflower Fried Rice are some of our favorite fried rice recipes on the blog! It is pretty obvious how obsessed with fried rice I am. It was the only thing that I would order growing up and I have always loved it so much! When I was taught all of the secret ways to make it from my Chinese sister in law, I can assure you that it is way better than any takeout you will ever get! 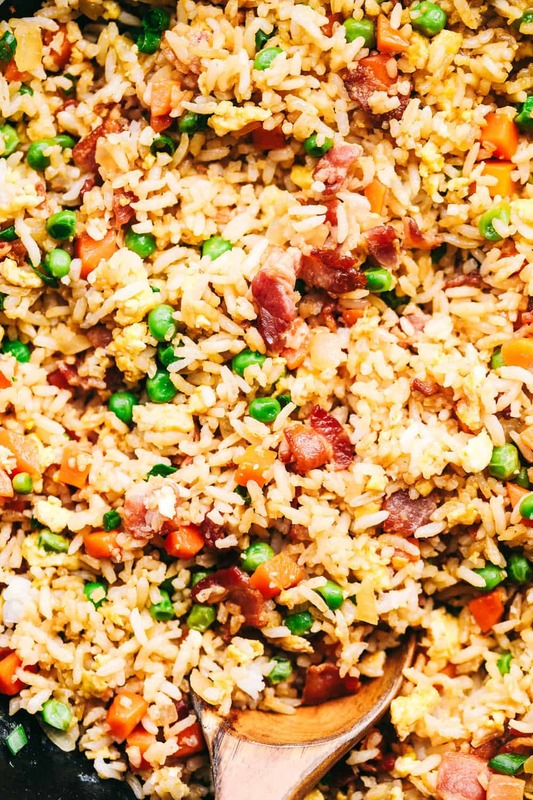 Every time we make anything asian inspired we always serve up this fried rice. We have even been known to have fried rice at the Thanksgiving dinner table. We love it that much. It is no shock that it is one of the number one searched recipes here on the blog! I decided to take it to the next level and add some crispy bacon. Not only that, you fry the veggies in the reserved bacon grease. This has so much amazing flavor. This was so delicious that my family couldn’t get enough of it! What ingredients go into fried rice? 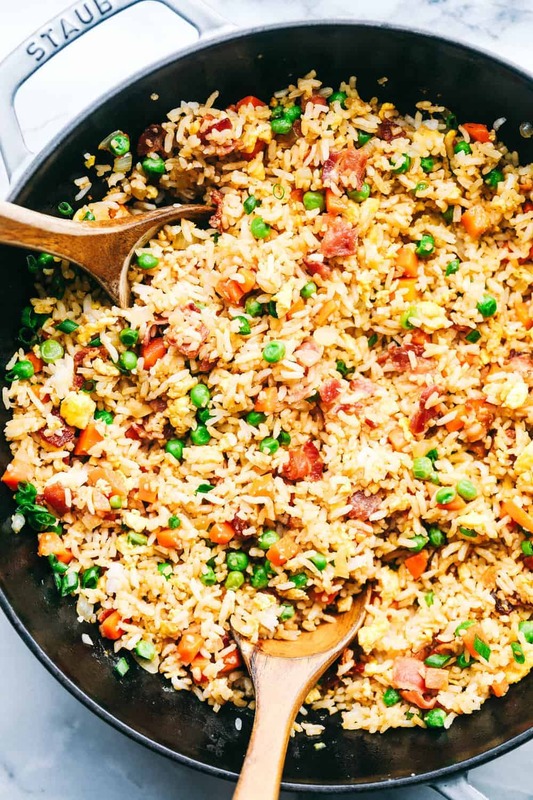 How do you make homemade fried rice? To start, add your chopped bacon to a medium sized skillet or work. Cook over medium high heat until it is crisp. Remove with a slotted spoon and drain the grease leaving about 1 tablespoon. 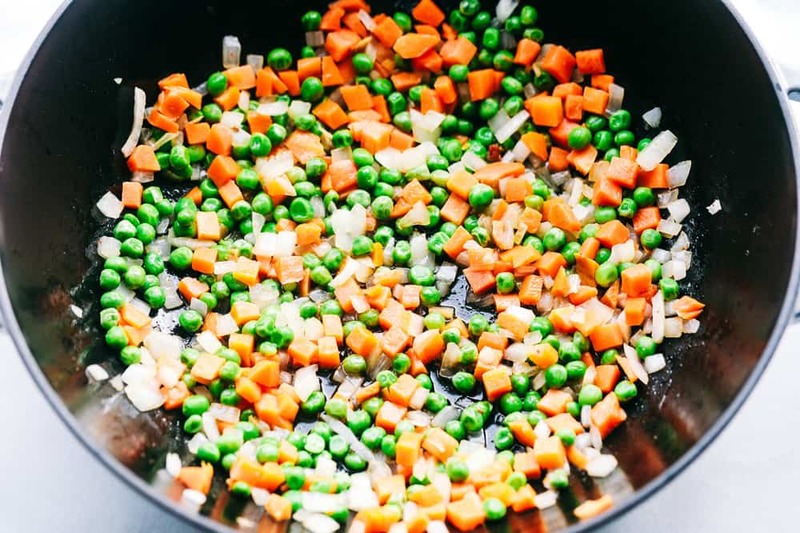 Next, add your chopped onion and frozen peas and carrots and sauté for 1-2 minutes until they are tender. Slide your veggies to one side and add the beaten egg to the other side. 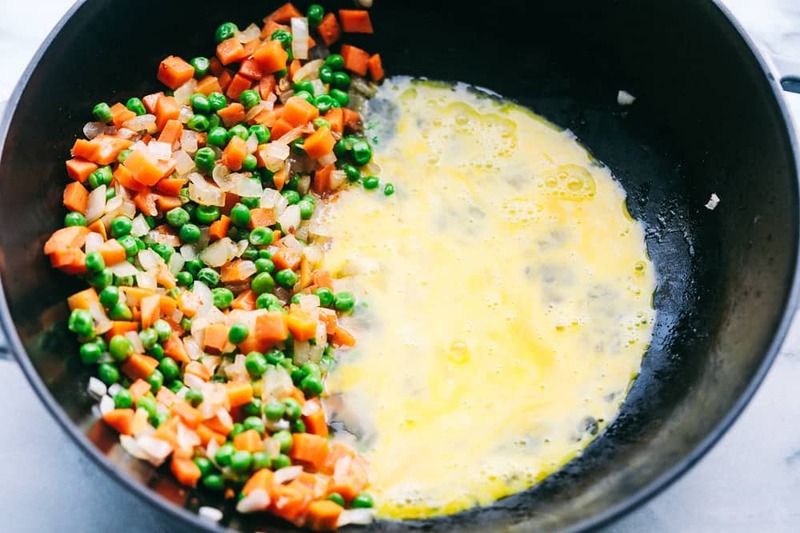 Scramble the egg until it is cooked through and combine it with the peas and carrots. Add cooked rice and bacon back to the skillet and combine. Add in sesame oil and soy sauce to taste. Let it heat through and serve immediately. Use day old cold rice. 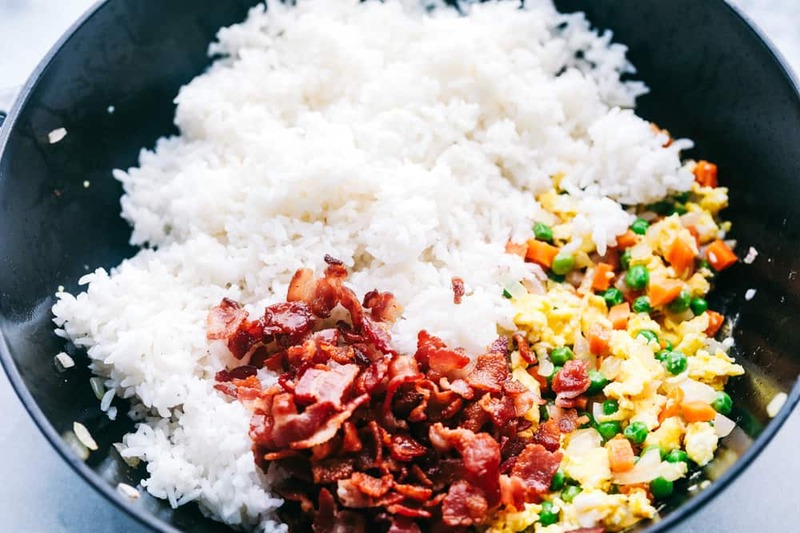 If you use warm, freshly made rice, your fried rice will most likely turn out soggy. Using day old rice helps to dry out the grains and give the rice a good texture. Add some sesame oil for flavoring. I always add sesame oil to my fried rice. This brings out the great asian flavor that we know and love. What rice is good for fried rice? Medium to long grain rice works the best. You can use Jasmine rice which will produce fluffy, sturdy grains that won’t clump or fall apart when you are frying. Shorter grain rice tends to be softer and stick together. Can Basmati Rice be used for fried rice? Yes! It is also a popular choice with Chinese and Indian cultures. 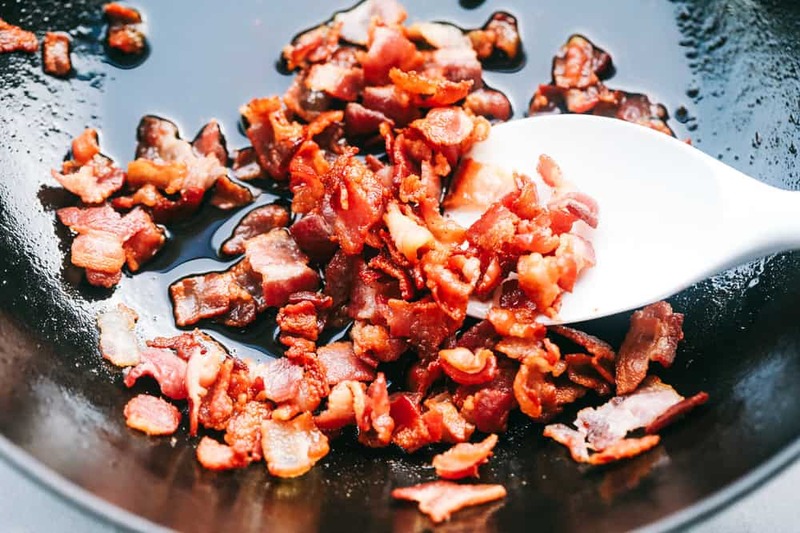 Add your chopped bacon to a medium sized skillet or work. Cook over medium high heat until it is crisp. Remove with a slotted spoon and drain the grease leaving about 1 tablespoon. Add cooked rice and bacon back to the skillet and combine. Add in sesame oil and soy sauce to taste. Let it heat through and garnish with chopped green onions.